When I was a preschool teacher, I noticed the children were frightened when a spider crawled into the classroom during a storm. They thought the spider wanted to hurt them, so they tried to hurt it first. I knew they would be less afraid and more compassionate if they understood that the spider was just trying to get out of the rain. 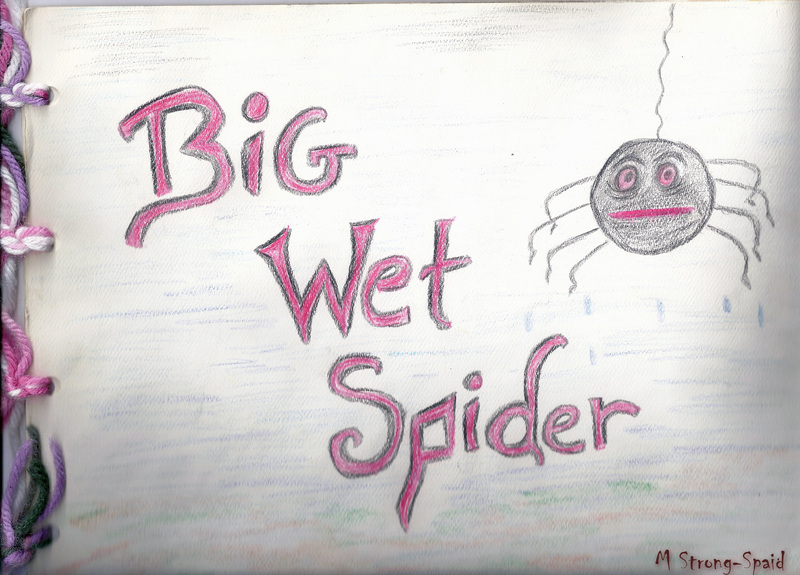 So, I made up a story about a big wet spider seeking refuge from a storm. underneath a bush in a puddle of water. “I need to be warm! I need to be dry! too close to my head. “I’m afraid of you, you big wet spider! “Can’t you see? Oh me! Oh my! I need to be warm! I need to be dry! Please let me stay here,” he said with a sigh. “O.K.,” I replied, “but not on my bed. I gave him a cookie for something to eat. “Good night,” I said after I lied down. He smiled at me and didn’t make a sound. This entry was posted in Children's stories, Nature, Poetry and tagged preschool, Spiders. Bookmark the permalink. I have always hated spiders, but I do love your story, SOO maybe next time I see one in the house I’ll think twice before killing it. Strangely enough, though they aren’t spiders I’ve never been bothered by Daddy Long Legs. I have no trouble picking them up or even letting them crawl on me. But spiders, totally another story and I have no idea why. BTW, I love all your writings. I’ve always been afraid of spiders….but I also have no problems picking up Daddy Long Legs because they have never bitten me. I have been bitten by a few “jumping” spiders though, and whenever I see them close by….I get nervous. Especially when I see them turning, and following me with their eyes as I walk by. I know they can jump a good distance when they see something they want to get.